The Unbearable Lightness of Form, a two person show at Autonomie with David French. 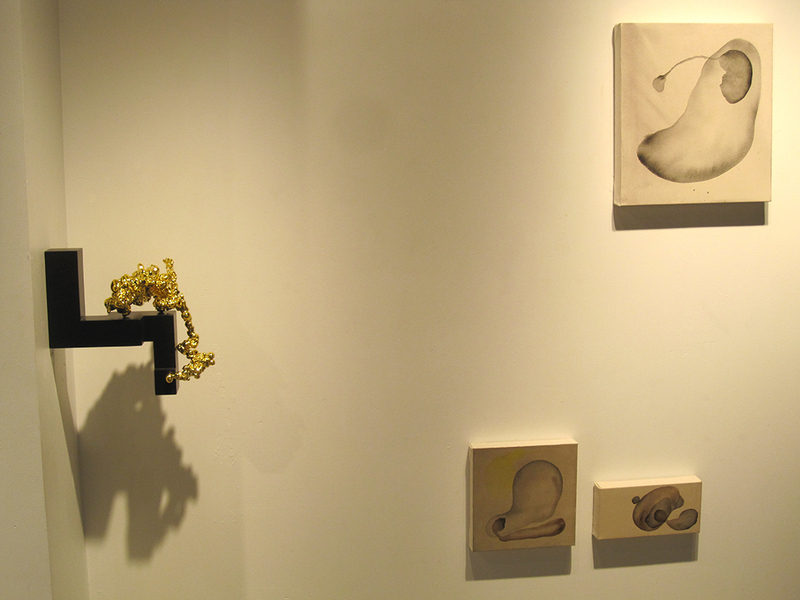 The work of Melanie Moore revolves around themes both organic and cosmic, formal and natural. Hers is an evolving art, one based on the germination of hidden and secret processes. 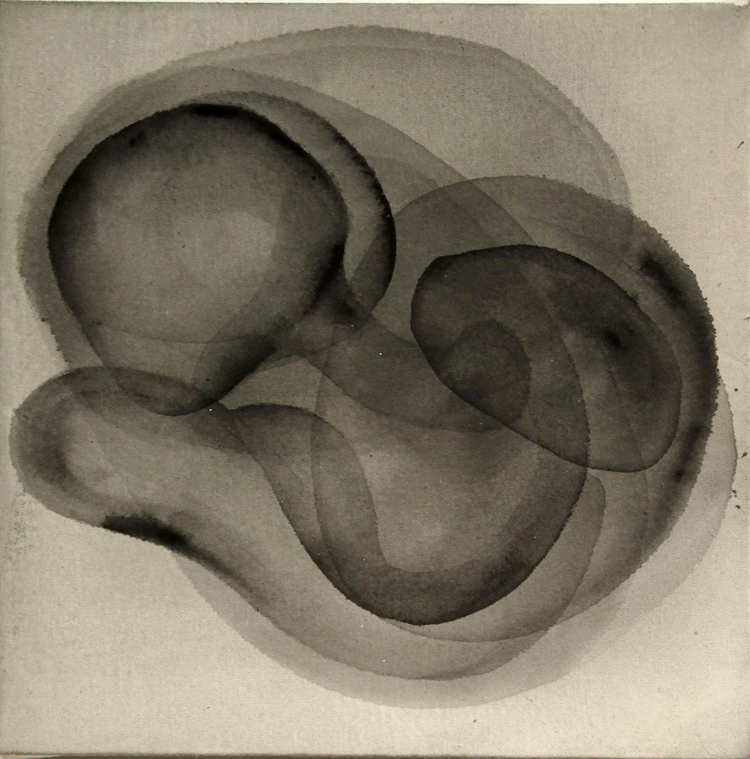 As a sustained meditation on macro and micro-logical processes, Moore’s abstract paintings often resemble cellular mitosis, embryonic growth, or the nebulous becomings of celestial bodies. Everywhere we find evidence of divergent permutations, sudden mutations and the slow gestation of trace forms in the process of unfolding. 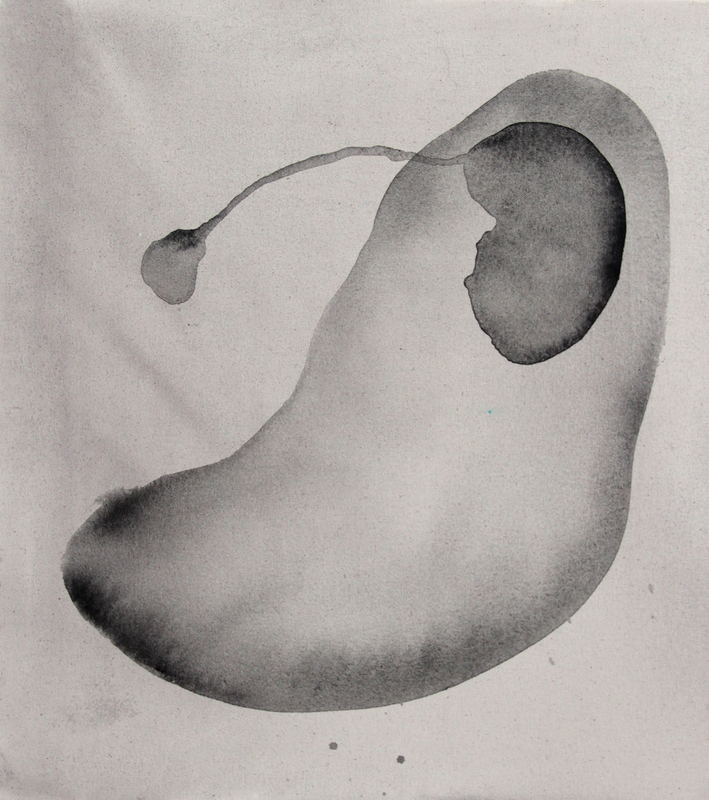 Moore’s work was previously invested in time-based processes and dissection of abstract forms. She achieved this through different strategies of taxonomy, often painting on multi-layered transparent panels that could be recombined to form a single work. As a virtual vivisection of gestural spills, pours and selective interventions, theses early works subdivided action painting into specific acts by highlighting the temporal dimension of gestural imagery. Over time, these additive strategies gave way to a dialog that was more overtly concerned with the rhetorics of display and disparate knowledges of application. This gave her work a new sense of complexity and a certain distance from expressive models of abstract painting that are still very much in vague today. Most recently however, her art practice has begun to capitalize on the power of singular forms and iconic images. Often highlighting just one or two floating forms, and sticking to a reduced pallet dominated by grays, black and silvers, Moore has chosen to focus on those elements which have become the hallmark of her artistic process. These qualities might best be described as a subtly of touch, a deft sense of compactness and an intimacy of scale appropriate to the work. Dynamic, delicate and amorphous, her paintings evoke an art of wonder — one which is focused on the natural world around us as well as those worlds that regularly escape perception. This is both the nature of their purchase in the present and their enduring contribution to the idiom of abstract art. Bio: Moore received her Masters in Fine Arts from Claremont Graduate University and her B.A. in Studio Art from the University of California, Irvine. She has recently shown in “All the worlds riches” at 2325 Artist Space, “Speculative Materialism” at Andi Compognone Projects and “Habits of Mind: Armory Fellows Show” in the Waterworks building at Colorado One. She works and lives in Los Angeles. French’s work is informed by a deep engagement with Baroque forms. The fragment, the ruin and dynamically twisted shapes permeate his entire oeuvre, which is a kind of grand theater of psychosexual anthropomorphisms. The seamless fabrication of his sculptures echoes the Baroque fascination with virtuosity while his choice of synthetic golds, royal purples and saturated reds allude to the power of inorganic objects and class politics. Implicit in French’s folding and curvilinear shapes is a different kind of story about the base matter of creation and the play of creative contingency. 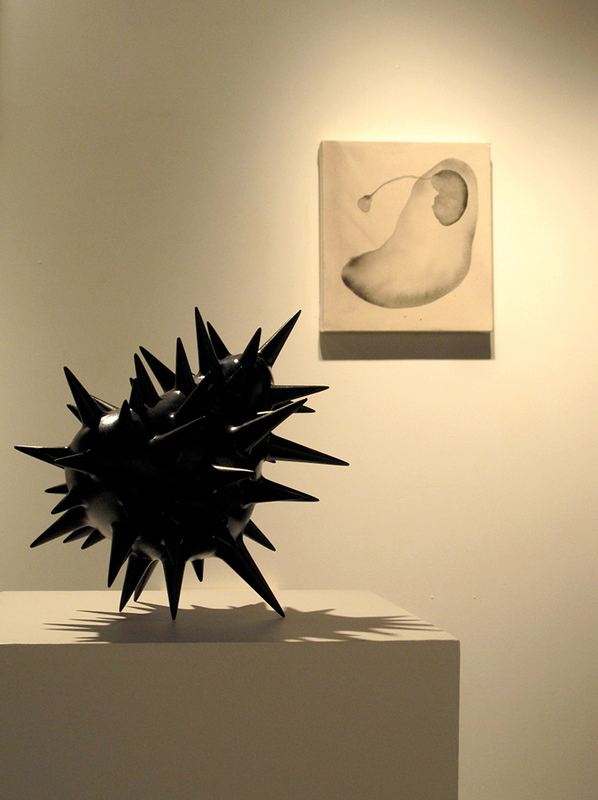 The spiky abstractions of blowfish-like forms, swirling organic motifs and hard earthen topologies all hold equal sway in French’s art practice. Over the last few years however, he has become more engaged with the rhetorical devices of prestige. In such a move, the formal aspects of Baroque aesthetics are married to the politics of the present by evoking the privilege accorded to high-end commodity forms. Some of French’s most recent works have made use of rapid prototyping techniques that create the feel of a techno-Baroque aesthetic, or what the theorist Norman Klein calls an Electronic Baroque that evades all traces of the human touch. This shift in French’s work charts a path that is as much about the evolution of forms as it is the politics of cultural production. Caught between seduction and simulation, his works point to a history of forms and colors that take as much from pre- and post-modern art as they do the ethos of high modernism. By combining computational and industrial fabrication techniques with a radical sensualism, French’s work makes us rethink the potential of material embodiment in a way that is as rare as it is beautiful. Bio: David French was born in England and earned his MA in Fine Art at Manchester Metropolitan University. He has exhibited his work in Tokyo, Brussels, Istanbul and Los Angeles. French has been commissioned to create work for public projects as well as private homes. He was presented with a commendation for the Public Art Project of the year by Huntington Beach’s Allied Arts Board. His work can also be seen this month at D.E.N. Contemporary in the Pacific Design Center. He lives and works in Los Angeles.